The Duff Guide to Ska: Duff Review: "Trojan 50th Anniversary Picture Disc" (plus Trojan Reloaded)! 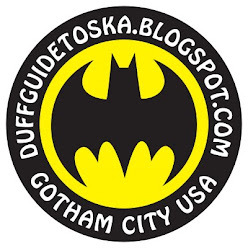 Duff Review: "Trojan 50th Anniversary Picture Disc" (plus Trojan Reloaded)! Of all the This Is Trojan 50! releases coming out this year celebrating the label's golden anniversary, the Trojan 50th Anniversary Picture Disc seemed like the most sensible one to pick up, since I felt compelled to partake in this significant milestone somehow ("The Story of Trojan Records" book by Laurence Cane-Honeysett comes out in October and I'll probably buy that, too). I've been collecting Trojan comps--the vast majority of them nothing short of excellent--since the early 1990s (some of my favorites include The Trojan Story, The Trojan Story Volume II, The Story of Trojan Records, Rebel Music, Reggae Chartbusters, Club Reggae, Blow Mr. Hornsman, Freedom Sounds, Music Is My Occupation, Clement "Coxsone" Dodd - Musical Fever 1967-1968, and Clancy Eccles And Friends - Fatty Fatty 1967 - 1970). Having said that, the downside of being along for the ride for several of Trojan's five decades has been seeing many of the same classic cuts packaged, go out of print, and then be repackaged over and over and over again. The Trojan 50 box set (priced at $135 in the USA and containing six CDs, four LPs, two 7" singles, and some label merch) is quite beautifully designed and contains a veritable treasure trove of Jamaican ska, rocksteady, and reggae; but unless you're new to the genre (and if you are, by all means buy this, since you'll own some of the greatest music ever recorded) or an obsessive Trojan collector that has to have everything, you already possess the majority of these songs. Being a sucker for vinyl and picture discs (and Trojan vinyl can be hard to come by in the states--on a recent trip to New Orleans, I picked up a pretty beat up copy of the phenomenal 1969 Reggae Chartbusters comp because it was the first copy I'd ever seen in all my many decades of crate digging and it contains Dandy Livingstone's awesome "Reggae in Your Jeggae"; fortunately, the surface noise doesn't distract too much and I paid less than $10 for it! ), I'm pretty pleased with my purchase. 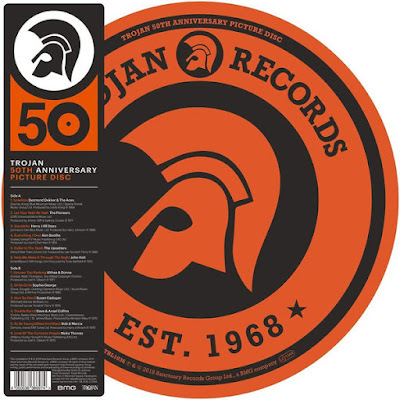 The selection of tracks on the Trojan 50th Anniversary Picture Disc--all UK top 10 chart hits back in the day--is unquestionably spectacular. Of all the late '60s/early '70s Trojan classics here (Desmond Dekker and The Aces' "Israelites," The Pioneers' "Let Your Yeah Be Yeah," Harry J All Stars' "Liquidator," Ken Boothe's "Everything I Own," The Upsetter's "Dollar In The Teeth," John Holt's Kris Kristofferson cover of "Help Me Make It Through the Night," Althea and Donna's "Uptown Ranking," Susan Cadogan's "Hurt So Good," Dave and Ansel Collins' "Double Barrel," Bob and Marcia's "To Be Young Gifted and Black," and Nicky Thomas' "Love of the Common People"), the only cut I was unfamiliar with (and am glad to have) is Sophia George's relatively late (1985) but great top #7 UK hit, "Girlie Girlie." This is a record you can put on at house party and just let it play. Duff Review: Heavyball "Black Eye Diaries"